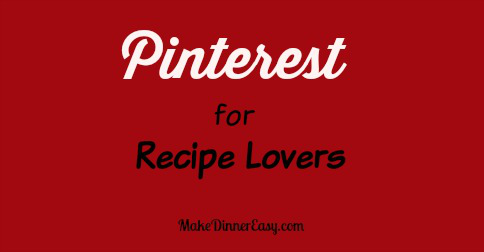 If you love finding new recipes and salivating over mouth watering food photos, Pinterest is a fun way to discover, save, and organize recipes and other ideas you see on the web so you can find them later. If you haven't tried Pinterest yet, here are the Pinterest Basics from Pinterest. In addition, this article from Real Simple Magazine gives you step by step instructions for how to set up your account and get started. Reading both of these articles will give you a great over view on how to use this really fun and helpful platform. Manage Your Boards: It's usually helpful to have more boards with specific names than a few boards loaded with pins. So, rather than just having a board for "Recipes to Try", you maight want a board for "Chicken Recipes", "Meatless Meals", "Breakfast Ideas" etc. You can move your boards around too, so they are in alphabetical order. Having 60 boards, I just did this and it makes finding things much easier! * Go to a friend's profile and look at the top right corner to see the people that they repin from the most. You can click on those people and see if you want to follow them. Using Pinterest to Search: I find the search function in Pinterest is better than using a regular search engine. If people have added a description to their pins, there pins will come up in search. So you can type in 4th of July recipes or ice cream pie recipes and see what you discover! *share and comment on pins you like, again your profile will show up under those pins, increasing your visibility. I'd also love for you to follow me on Pinterest if you like recipes and cooking. 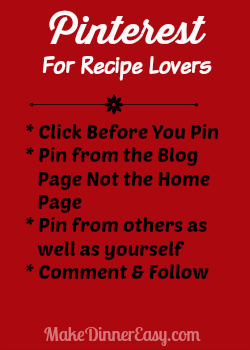 I have 60 boards right now and yes I do have recipes posted from my site but I post recipes from lots of other sites that I run across as well. If you like any of my pins, I'd really appreciate you re-pinning! If you have other tips for using Pinterest, please comment below!